Using recycled cotton drawstring bags for shopping is an eco-friendly, sustainable, ethical, vegan solution for avoiding plastic waste. Either on the farmers market or in your favorite grocery bulk store you can easily replace plastic bags. 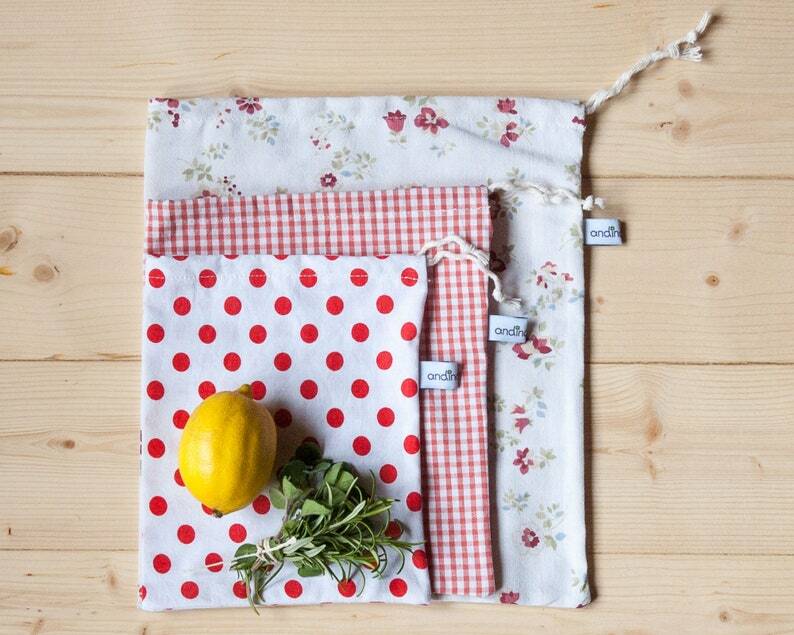 Use these pretty produce bags for bulk shopping your fruits, vegetables, nuts and so much more! The recycled bulk bags are light and foldable, easily fit into your tote bag and are also easy to clean. These cotton produce bags were handmade from upcycled cotton fabric. Start reducing your eco foot print and buy these drawstring bags now! You can put these pretty bulk bags directly into your fridge or pantry. When they are emptied, you can machine wash them if needed, or just fold them and put them in your reusable grocery bag for your next zero waste shopping! They are also suitable to take to your travels as a laundry bag or keeping your lingerie or shoes separated. * LARGE: about 10" * 12" or 25 cm * 30 cm and TARA: about 1 oz or 30 g.
e.g. for about 4 pounds/2 kgs of potatoes or other veggies or fruits. One set contains one of each size with ONE pattern except for the Surprise mix option. If you would like MULTIPLE PATTERNS AND/or SIZES within your set, please follow the instruction for the Custom sets below! If you would like different combinations and quantities of the reusable produce bags, including multiple patterns in a set, please send me a message by clicking on the "Ask a question" button and I will be back to you within 24 hours! I am happy to make your favorite combo! Surprise mix: I will choose a mix from the available patterns. Since I use upcycled fabrics to make these multipurpose bulk bags, patterns and colors are available in limited quantities only. If you would like something different than pictured, please contact me; I would be happy to help! Wash your produce bags in your normal laundry with like colors. Air dry if you can to save energy! WHY IS UPCYCLED COTTON FABRIC BETTER THAN ORGANIC? 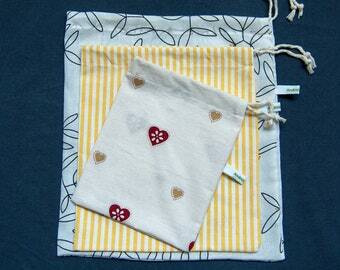 To make these reusable cotton bulk bags I use locally sourced, upcycled fabrics. These are already available, no need to produce new materials with the use of plenty of water, energy and labor. Organic is cleaner than traditional production, but the main polluting factor in cotton production is the huge water demand. By using upcycled fabrics we can avoid unnecessary waste of precious water. As I am on my journey to a zero waste life wherever possible I want to follow this practice in business as well. When possible I use recycled materials for packaging. SHIPPING: please read the Shipping policies for estimated shipping times to your location! I ship with priority. 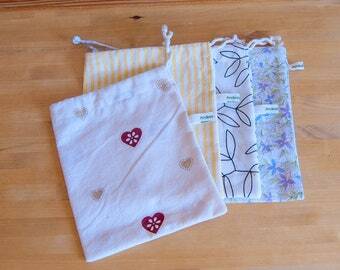 Gift bags for the reusable cotton rounds only! Please send a Message to seller with your choice of color! These cannot be used as wash bags! Very nicely made! Will use these often. Lovely bags, arrived quickly. I use the little one for nuts and sultanas, the medium one for my lunch tupperware, and the big one for my gym kit or my veg shop!